The first world and the #symbol is connected to the lowest #roots underneath #MotherEarth.The brown colour and the way of the symbolic stitches look like roots. The second world and the #symbol is connected to the fire /lava energy underneath #MotherEarth.The #red colour stands for #fire and the symbolic stitches look like fire spreading in different directions🔥. The third world and the #symbol is connected to the waters of #MotherEarth.The blue colour and the way of the symbolic stitches look like a #river in the #flow. The forth world and the #symbol is connected to the earth anong living things, our beloved #MotherEarth.The brown colour stands for #roots and #earth element and the orange for life on earth.And the symbolic crosses show how interconnected life and earth are. The fifth world and the #symbol represents the first #sun rays shining down to #MotherEarth.The yellow colour stands for sun and the stitched symbol shows the sun's rays🌞. The sixth world and the #symbol represents the #seeds of #life.The yellow colour stands for sun and the stitched symbol shows the seeds or ideas thst get born when light shines on them🌞. Since there are no coincidences, only #synchrodestiny: I am mumber 6 in #numerology which stands for acceptance and #vision. And me planting seeds at special power places and stitching sacred symbols is like seeding divine seeds, too🌱❤. Accepting the gifts which come from the dark soil and getting to the root of ourselves, and then let the fruits blossom on the outside by letting the light on those💫🌞. This #symbol stands for the #Goddess #bereginya #Muse which I stitched on my #destinydress on my sleeves.The sleeves representing the #wings of the #tree when I lift them up. And this symbol showing its energy of the muse expressing through me with abilities that will support me in the future. I actually did a #ritual to invite this Goddess and the Muse in when I wrote my book 'The #Wyrding Way: the mysterious art of weaving your own #destiny'.For that, I always put my destiny dress with those different Goddess symbols on and invited the Muse. And then the writing literally just worked through me like a river, a smooth flow.Magic in action and how those symbols literally invite and manifest this magic through the expression of this certain energy in the NOW. Wyrding Way in action😊. This #symbol stand for the #Goddess of ultimate #Power. She carries all #seeds inside and through the colour of black is connected with #MotherEarth and all #ancestors.By centering herself in the Womb of all Existance, she births everything anew.This symbol is at the bottom of my #destinydress, for those energies and power to express through me via #connection with my #roots and those from the tree wide web. This #symbol represents the #energy of the #Goddess of #harmony and #balance.She tells you to find out your truth and gifts and go for them but at the same time keeping a healthy relationship to yourself and others. How can my book 'The Wyrding Way: the mysterious art of how you can weave your own destiny' help others? How does my #sacredembroidery practice of #sacredsymbols and my #book 'The Wyrding Way: mysterious art of weaving destiny' help others? They can pick up their own unique #threadsoflife and consciously weave their #destiny in the world wide tapestry of life.They will feel connected to their Soul's Purpose, other people and the whole universe around.Connected on the human, spiritual and universal level.Connected to their own Soul and the Soul of the World, web of life, which I call #wyrd. Then they can live a co-creative life with their Soul and Source. People will learn how to get centered, get in touch with their own Soul within, becoming a co-creative vessel through which the Spirit expresses itself. So let's start to weave, and the divine will provide the thread.That is #cocreation par excellance. In a #SoulHoroscopeReading I received this symbol of the #raven as my main #Goddess/ #Beregina power working and expressing through me.It stands for the wisdom of #ancestors.It feels so touching and truly embodied since the old Shaman wise woman in Mongolia told me very similar things:"Good that you returned home to your ancestral land around the #AlteiMountain region.And so continue to connect with your ancestors as much as possible and continue to lead the thread of your ancestors".You can find out more here:www.erikaamaizing.me/about-me. So I stitched my main symbol in my #destiny dress which I wear for rituals like yesterday to do a #FullMoon ritual. This self stitched #symbol stands for #abundance with the #seeds from within. After I stitched this symbol, I started my Training to become a Soul based Coach, learning to tap into our inner wisdom of the #Soul and help others to communicate with theirs, where we all carry our #truth and true abundance within. Symbol of family and abundance on my destiny rug "Rushnyk"
I have embroidered this #symbol on my #destiny towel called #Rushnyk. It represents the energy of #family and #abundance. The green dots are #seeds and show our inherited #gifts inside which we all carry within ourselves.And then with the yellow lines pointing outwards,we can also magnetise abundance from the outside. I have embroidered this #symbol on my #destiny towel called #Rushnyk and also in my destiny dress with my main 7 Goddess Symbols.It represents the energy of #joy and also the Goddess of #Protection.When I do #FullMoon rituals I put this symbol on my candle or put the candle on this symbol in the middle.That way my #ancestors are present and protect me. So, would't you like to remember and pick up this mysterious art of consciously weaving your own thread of destiny? All over the world, women come together in circles to tell stories in stitch. following the Slavic embroidery tradition, girls of seven years already start to stitch their destiny towels called "Rushnyk", stitching certain symbols to manifest certain things in their lives. In this tradition, women also stitch certain destinies through symbols for babies, married couples, diseased people to take in their graves and for certain other important occasions.this is a powerful long tradition of consciously manifesting destiny. The symbol of love in my destiny rug "Rushnyk"
This #symbol of #love, I stitched in my destiny rug called #Rushnyk in #Slawic tradition in summer of 2017. Just two months later I met my Soulpartner and we were ever so happy until a few weeks back. Eventhough the partnership ended due to different life missions, it was the most deep and beautiful Soul to Soul time together where I do not regret one minute. I strongly feel that those self stitched symbols when embroidered with full consciousness and connected to the energies of the particular symbol, help us manifest those energies in the here and now. That is why they are called destiny towels. It us all about co-creative weaving with #Source and #Shakti. The symbol of feminine power on my destiny rug "Rushnyk"
This #symbol stands for #femininepower and I have embroidered it on my #destiny towel called #Rushnyk in Slawic tradition back in 2017. Ever since, this feminine power has manifested in my life through regular local feminine temple groups, my connection to Slawic embroidery teacher and esp. the initiation of how to weave destiny through the three #Norns Urd, Verdanti and Skuld. My first draft of the book 'The Wyrding way: the mysterious art of weaving destiny' is born and waits to be spreaded into the world. In this symbol, the feminine power comes from #MotherEarth.Thats why women in Slawic tradition also wear long skirts which touch the ground. They receive the Earth energies from below which gives roots and true #power. The symbol of beauty in my destiny rug "Rushnyk"
This symbol which I embroidered in my destiny rug called #Rushnyk represents and manifests #beauty. Here the arms turn to the bottom, gaining power and connection with #MotherEarth.There is another version of the woman lifting her arms into the sky. But for me it felt stronger to connect with Earth Energy which grounds me in my body and in the #hereandnow. Before I stitch I always connect with my Soul, Mother Earth and Spirit. For that I like to do the Inner Tree Meditation by #treesisters and #huul meditation by the Shaman Thunderwizard. Once connected with divine forces, I literally manifest this symbol's energy in this reality. This magical process,I call #wyrding. The symbol of abundance in my destiny rug "Rushnyk"
Ever since those seeds have sprouted and turned to true inner abundance through the Training and Certification of my journey to become a Soul based Coach and also to great contact to other indigenous women all around the world. 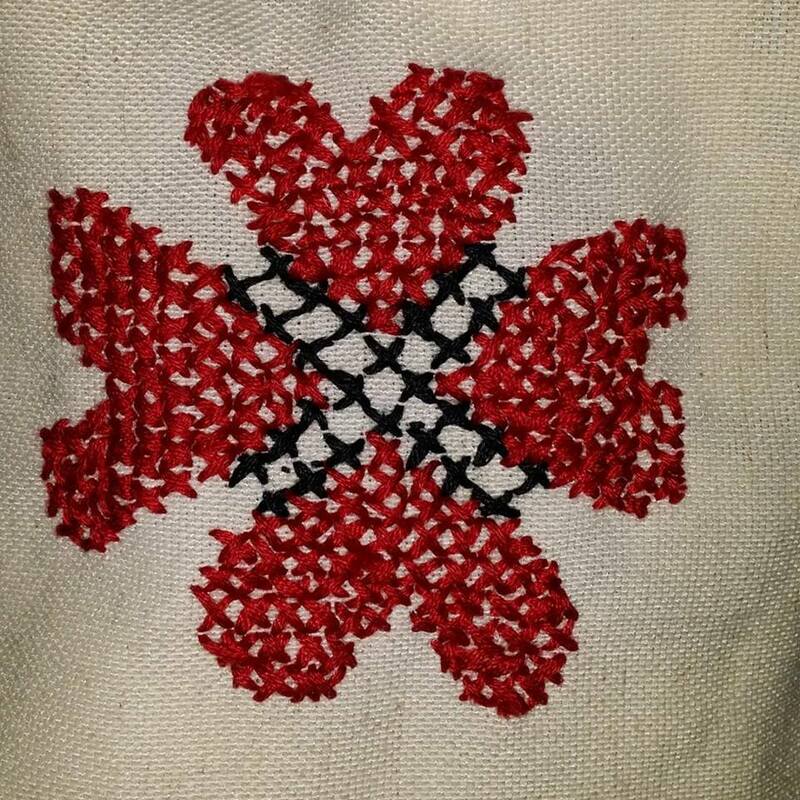 So there is really something powerful about stitching those power symbols in fabric and esp. in my destiny rug. It is magic in action where the energies of the symbols manifest in reality. I have embroidered the symbol of the Slavic Goddess Mokosh in my belt of my destiny dress. Mokosh stands for fertility and also #weaving in Slavic culture. Through embroidery, so the tradition goes, I have invited and manifested the same qualities of this Goddess. That makes the embroidery practice sacred and divine to me. Here are some examples of the Goddess Symbols Standing for the Supporter, Courageous and Priestess. Something that you did or said worked well (or not well) for me was…. When receiving feedback like this, I have never been triggered or like I have been personally attacked without any clues of what actually went wrong. I felt like this sort of closed off comment “YOU can’t accept….” was like a hit on the head with a hammer or like it is also known in German “Killerphrase” without any opportunity to say something on my behalf or how I see the situation. And least of all leading an open converstion where both sides can be heard and the exact details are discussed which brought about the comment or criticism. I certainly was left with a feeling “You are wrong” without any constructive feedback of what I could do better or what I did wrong in the first place. For better communication at work between colleagues, but also in any other conversation in general, why not try to use the Clean Feedback instead of one way “killerphrasing” someone or eachother? Ich werde auch noch einen Blogartikel darüber schreiben, da ich aber mehr in Bildern bzw. Metaphern fühle und sehe, und auch gerne Märchen und Geschichten lese, hier erstmal mein Vlog in Form von einfachem "Erzählen". I will write a detailed blog article about the trip, but since I feel and see more in pictures and metaphors; and also love to read fairy tales and stories, I made a start with this Vlog in form of storytelling;-) I hope you like it. Feel free to comment. I would love to hear your Feedback. "When I learned to embroider Kasakh style embroidery in Mongolia with an old indigenous lady, I felt such a deep reconnective moment when looking into her eyes: it was like the grandmother of all origins from this cultural background called Umaj, was speaking to me and was saying: „So good you returned back home and that you started to hold the ancestral thread. Now continue to recover all the lost stories and threads from our cultural heritage.“ (More here: https://erikaamaizing.me/about-me/). And so I continue with holding the thread by visiting the Altei Mountains in About one week, see trip here: http://www.ahamkara.org/trip-to-altai.html.